Thanksgiving Traditions, Crafts, Snacks and More! I never really paid attention to all the fun and cute Thanksgiving crafts that were out there until I had a child. I always just thought Thanksgiving was about stuffing my face full of too much food, hanging out with family and being thankful for all of my blessings. Don't get me wrong, all three of these traditions are wonderful, but now I've discovered there's even more fun to be had. 1) Handprint Turkeys - Not a new idea, but a good one. I remember making handprint turkeys as a kid myself and I think the idea is just as good now. 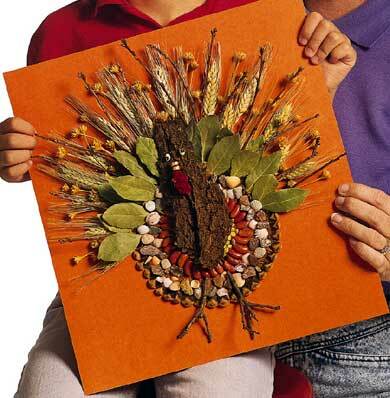 Send a simple Thanksgiving card featuring your child's handprint turkey, decorate a plate (paper or ceramic), make an apron or a table-runner to use year after year. 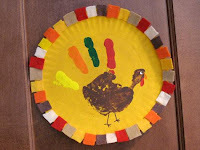 This instructions for this cute turkey plate, can be found on Kaboose. 2) Cute Turkey Snack - Stella loves fruit and I'm sure when she's old enough to appreciate it in the shape of a turkey, I'll be happy to make her this adorable healthy and delicious Thanksgiving-themed snack. This recipe is compliments of Family Fun Magazine. 3) Thankful Tree - There are so many ways to celebrate your gratitude on Thanksgiving. You can write in a journal, craft a paper chain, simply go around the table and announce your gratitude, or you can make a Thankful Tree. With all the ideas out there, this is my favorite because it doubles as a beautiful and unique centerpiece for your Thanksgiving Day feast. I found this idea on PBS Parents. 4) Wild Turkey - This looks like a great craft to make when Stella is a little older. Not only does it involve a little nature hunt to gather sticks, bark, seeds and more, but it's just plain cool-looking. I'm sure it would keep a child busy for a long time as they glue on all the various pieces to design their own turkey masterpiece. I can't wait to make one! Idea courtesy of Better Home and Gardens. 5) Paper Pilgrim Hats - These are just too cute and I think Stella and her cousins would make some adorable pilgrims. Not to mention, if I could pull off getting the cousins to all wear pilgrim hats, it would be a nice photo op. While I might be able to manage making the hats before our get-together on Saturday, it will take an act of God to get all six kids to sit still, smile and look at the camera. Wish me luck and thank Martha Stewart for providing the instructions and templates for the female bonnet and the male hat. Thanks Martha! 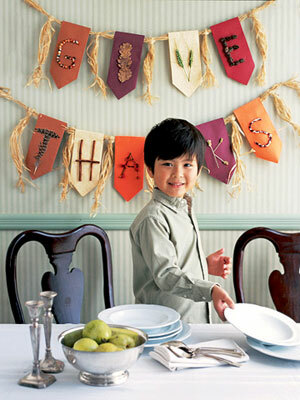 6) Give Thanks Banner - Banners seem to be all the crafting rage lately and this Thanksgiving Day banner is right up my alley. I don't have a lot of Thanksgiving Day decorations, and I think my dining room could use a little sprucing up for our dinner on Thursday. We'll see if I can pull it off before then, but if not, there's always next year. This banner idea comes to us from Parents.